by Feenstra, Robert C., Taylor, Alan M.
Comments: Good Condition. Has writing/highlighting. Five star seller - Buy with confidence! Feenstra, Robert C., Taylor, Alan M.
Combining classic international economics with straight-from-the-headlines immediacy, Feenstra and Taylor's text seamlessly integrates the subject's established core content with new topic areas and new ideas that have emerged from recent empirical studies. Like no other textbook it brings cutting-edge theory, evidence, and policy analysis to the field of international economics. International Economics is available as a complete textbook or in two split volumes: "International Trade" and "International Macroeconomics. 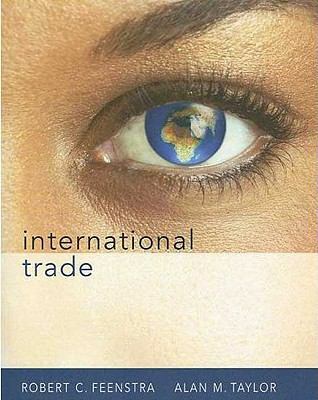 "Feenstra, Robert C. is the author of 'International Trade', published 2007 under ISBN 9781429206907 and ISBN 142920690X. Loading marketplace prices 6 copies from $1.79 How does the rental process work?